BREAKING! OU Contradicts Itself On 'Throat-Ripping' Rationale – Was Humane Slaughter Act Violated? Federal and state officials, noting the sensitivity of regulating religious rituals, have responded cautiously. The USDA sent four investigators to the Postville plant Dec. 2, two days after PETA made the videotape public. Their inquiry remains open and has neither exonerated the plant nor concluded that it broke federal laws on humane handling of livestock, USDA spokesman Matt Baun said. Remember, folks. You read it here first. Ben Goldsmith of PETA has written a response to the most recent Shechita-gate article by Agudath Israel's Rabbi Avi Shafran. PETA has no interest in undermining rabbinic authority, and it is not our desire to “impose new rules on Jewish ritual.” The issue here should be halacha, not an imagined power struggle. Our only objective is to assure that rabbinic authorities live up to the precepts of Jewish law that forbid causing unnecessary suffering to animals. You can read it all after the jump. The OU's Rabbi Menachem Genack has written a new article on Shechita-gate. [N]ot done for kashrut reasons – for after the trachea and esophagus have been severed the shechita is complete – but rather for commercial reasons, to avoid blood splash, which turns the meat a darker color. The carotid arteries are attached to the trachea and at AgriProcessors the trachea was excised to facilitate the bleeding. It appears that by definition the second cut was a dressing procedure. This would mean that every second cut performed at AgriProcessors violated the Humane Slaughter Act and may expose the kosher certifying agencies and AgriProcessors to both Federal, State and Local prosecution. You can read the entire article here or after the jump. I spoke with Trent Berhow, the Vice-Chairman of the National Joint Council of Food Safety Inspection Locals (the union of food safety inspectors) a few moments ago about the Rubashkin Shechita-gate Scandal. The Waukon Standard reports on PETA's call for prosecution of AgriProcsessors. "The Iowa secretary of agriculture has understandably expressed her revulsion at what AgriProcessors was doing to animals," says PETA President Ingrid E. Newkirk. "What AgriProcessors was doing behind closed doors is the ultimate violation of 'Iowa nice,' and we are calling on Mr. Shafer to take swift and decisive action against the company, its owner, and the kosher certification agencies that allowed state law to be so flagrantly violated." Donations to aid the survivors of the massive Tsunami that struck South East Aisa can be made through American Jewish World Service by mail, telephone or online. American Jewish World Service, Asia Tsunami Relief, 45 West 36th Street, 10th Floor, New York, NY 10018, 1-800-889-7146 or Donate Now Online. The estimated death toll at this writing is more than 100,000 people. The Jewish religious tradition forbids causing animals unnecessary pain.… But the Jewish faith expressly permits the killing of animals for human needs, including food. Which animals may be eaten and how to dispatch them are topics dealt with at considerable length in Jewish legal literature. But, why then do Jewish leaders fail to speak out against the many abuses of animals on factory farms? For example, the killing almost immediately after birth of 250 million male chicks [every year] in the U.S. alone at egg-laying hatcheries because they can’t lay eggs and they are not of the breed (broilers) that have been genetically programmed to provide much meat; taking calves from their mothers after one day to raise them as veal; the force feeding of ducks and geese to produce foie gras; raising hens in spaces so small that they can’t raise even one wing, and then debeaking them to prevent them from pecking other hens in their very crowded, unnatural conditions; and much more. Of course, Mr. Schwartz's question applies equally well to the OU, KAJ and other kosher supervising agencies as well as to the leaders of Agudath Israel, the RCA, Igud HaRabbonim, Agudas HaRabbonim, etc. Perhaps our rabbinic leaders will answer this important question for us. KWWL, which bills itself as "Iowa's News Channel," has a report on yesterday's PETA protest at the Allamakee county courthouse. KCRG-TV of Cedar Rapids, Iowa has done a brief report on the Rubashkin Shechita-gate situation. Please note Sholom M. Rubashkin's circular reasoning: Kosher slaughter is humane because the US Government defines kosher slaughter as humane, therefore, AgriProcessors slaughter – because it is kosher – is humane. The USDA has begun to weigh in on the Rubashkin Shechita-gate scandal. It has posted a training document that tells inspectors to shut down plants doing shechita like Rubashkin was doing on the PETA video. It is becoming clear that the OU's mandated changes came not just from public pressure, but from government enforcement. The New York Times has a valuable article on kosher business travel. You can read it all here. Rabbi Yudel Shain of the Lakewood, NJ-based Kosher Consumers Union has made serious allegations about the state of kosher supervision at AgriProcessors. The Chicago Rabbinical Council On Rubashkin Shechita: "This Is Basically The Exact Way That God Asked Us To Do It." "Does the meat technically fulfill the requirements of kosher slaughter? Yes," said Rabbi Elliot Dorff, a leading philosopher in the Conservative Jewish movement. "But if by calling it 'not kosher' [you] mean that the meat should not be eaten, I agree with that. The way it's produced violates Jewish law." "This is the way we did it in the Holy Temple all those years. This is basically the exact way that God asked us to do it," said Rabbi Sholem Fishbane, who supervises kosher slaughterhouses for the Chicago Rabbinical Council. "The PETA video wasn't pretty, that's for sure," Fishbane said. "But the meat was definitely kosher." Waukon, Iowa — After a statement by Iowa Secretary of Agriculture Patty Judge indicated that Postville-based slaughterhouse AgriProcessors, Inc., is subject to the local cruelty-to-animals statute, PETA will formally call for charges against the company at a news conference tomorrow. You can read PETA's entire press release after the jump. According to Kosher Today, the OU's Rabbi Menachem Genack has written an op-ed article on the Postville Rubashkin Shechita-gate Scandal. 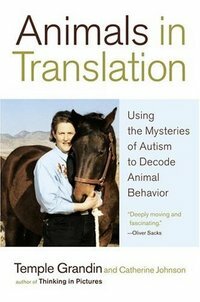 Dr. Temple Grandin has written a new book, ANIMALS IN TRANSLATION: Using the Mysteries of Autism to Decode Animal Behavior. The New York Times review can be read here. The first chapter is online here. The book can be purchased (at 30% off the retail price), and the Publisher's Weekly starred review read, here. No one can deny that, physiologically, “where pain is concerned, a rat is a pig is a dog is a boy.” This does not mean that all animals are morally equivalent; it simply conveys that God designed us out of flesh, blood, bone, and he endowed us with the same capacity to feel pain. No scientist will deny this, because it’s true. And watching as they struggle to stand and flee while their windpipes hang from their bloody throats, one cannot deny that the animals at AgriProcessors felt immeasurable agony and terror as they fought against death. Indeed, our respect for the uniquely human ability to make complex moral calculations is central to our mission at PETA. As human beings, we have an obligation to make compassionate choices when possible. As Rabbi Shafran notes, for many, this calculation leads them to vegetarianism. For all, however, it should lead to profound moral outrage at the horrific and consistent cruelty to animals perpetrated by AgriProcessors for so many years. Agudath Israel Of America – Does Truth Matter? Agudath Israel's Rabbi Avi Shafran has written another piece on the Rubashkin Shechita-gate Scandal. Parts of cattle supposedly banned under rules enacted after the nation's first case of mad cow disease are making it into the human food chain, according to the union that represents federal inspectors in meat plants. The union based its Dec. 8 complaint on reports from inspectors in several states, though it declined to say which ones. I wonder if any of these plants are located in Postville, Iowa? Some Orthodox rabbis urged that in order to avoid a public misperception of cruelty, one step in the process — a second cut and removal of the trachea — not be done. So it appears that throat-ripping was the norm at AgriProcessors for some time. Agriprocessor's spokesman Mike Thomas has denied this. Rabbis Kohn, Genack and Belsky have also denied it. Yet Mr. Lewin has now (unwittingly?) confirmed this barbaric practice was the norm. Perhaps this is because PETA claims to have more than 5 hours of video tape proving throat-ripping always took place at Rubashkin's plant. But more likely it is because PETA gave all 5 hours of this tape to the USDA. Is Nathan Lewin Telling The Truth? You Be the Judge. Nathan Lewin, Rubashkin's attorney, has written another piece, this time for the New York Jewish Week attacking PETA, predictably begining with a comparison of PETA's actions and those of the Nazis. Mr. Lewin then goes on to state his 'scientific' evidence in support of Rubashkin's slaughter. You'll note that all of Lewin's 'scientific' evidence is from the 1920-50's (before EEG's and other technology existed to help determine consciousness) and he completely misrepresents the scope of PETA's activities. 1. Repair your unloading ramps. 2. Restrict the use of electric prods. 3. Ensure that no more than 5 percent of cows vocalize. 4. Ensure that each chicken is held one at a time, by one person, for slaughter. 5. Provide fresh, clean water for all animals at unloading. 6. Ensure that all animals are calm at all stages of processing. 7. Engage in self-audits on a regular basis. Mr. Lewin then gratuitously adds that none of PETA's seven demands "involved violations of Jewish law." "It is forbidden to use any form of electric prod to herd the animals into the slaughtering stand." You can read Mr. Lewin's article here or after the jump. You Be the Judge – Is Menachem Lubinsky Telling The Truth? The fact that Levinger watched them do it correctly strengthens our case, really: I would bet that none of these animals showed the signs of consciousness that we documented in 1/4 of the animals during our sample. The challenge to Rubashkin is to find someone to say that what we documented is not a problem. This nonsense is like a serial killer calling you over to his house to watch him not kill people: "See, I'm not killing anyone." Of course they CAN do it right – our point is that they can do it right but didn't – that's why what they did was illegal. A criminal can be law-abiding, but that doesn't exonerate them for their crimes. Rabbi Dr. I.M. Levinger, the Orthodox Jewish world's expert on and protector of shechita, has lent his name to Rubashkin and "koshered" Rubaskin slaughter. "In the process of handling the animals prior to schechita, care was taken to lead the animal into the pen in a most humane manner. The schechita process was performed swiftly and correctly." "The rabbis performing schechita impressed me as experts in their profession. The cut was done in an expeditious manner, cutting the trachea and esophagus, and severing the carotid arteries and jugular veins. It is my impression that schechita in this facility is performed in accordance with the highest standards of kosher handling. The behavior of the animals seem to be in accordance with the observations recorded in my book 'Schechita in The Light of The Year 2000.'" Rabbi Dr. Levinger saw "150 animals" slaughtered. The Rubashkin press release does not specify whether these "150 animals" were cattle or a mixture of cattle and poultry. During the two days Rabbi Dr. Levinger spent at AgriProcessors, 1000 cattle and tens of thousands of chickens were killed. Rabbi Dr. Levinger saw only a tiny minority of them. Rabbi Dr. Levinger was invited by (and his expenses and perhaps a fee paid by) Rubashkin. Rubashkin knew when Rabbi Dr. Levinger's 'visit' would take place, and could staff his facility accordingly. Normal audits are done without notice and are much more intensive. Most importantly, Rabbi Dr. Levinger can only address what he saw today and yesterday, not what took place last month and in the months prior to that. In other words, Rabbi Dr. Levinger's evaluation does not apply to PETA's charges and Rubashkin's past conduct. It also does not address USDA regulations met by other kosher plants but apparently violated by Rubashkin. That Rabbi Dr. Levinger allowed his name to be used by Rubashkin in this manner without clearly specifying that his comments can not apply to events that took place prior to December 20 and 21, 2004 is troubling and calls his status as an independent expert into serious question. Rabbi Dr. Levinger also put a plug for his book in his statement. You can read the entire Rubashkin press release after the jump. The Food Marketing Institute's Recommended Ritual Slaughter Guidelines explain in great detail what should (and should not) take place before and after shechita. According to a press release issued this morning by PETA, both Albertsons and Safeway, two large customers for Rubashkin's non-kosher product, are demanding major changes and independent, unannounced audits at Agriprocessors. Pleasanton, Calif. — On the heels of a PETA investigation that revealed horrific cruelty to animals at a massive Iowa slaughterhouse, grocery giants Safeway and Albertson’s, both of which were rated among the top 40 largest corporations in the United States by Fortune magazine, have informed the plant that they will require sweeping changes to the procedures documented by PETA, as well as unannounced audits of the plant. You can read the entire PETA release after the jump. What is Quality Kosher Products, Inc.? LA-based Kehilla Kosher Products, Inc. is another agency providing kosher supervision at AgriProcessors in Postville, Iowa. Kehilla seems to have its financials in order. The OK (a.k.a. The Committee For The Advancement Of Torah) has a house organ, The Jewish Homemaker. It filed with the IRS as a separate non-profit in 2000 through 2003. You can read a financial summary of The Jewish Homemaker's most recent filing here. Globes, the Israeli business daily, has weighed in on the Rubashkin Shechita-gate Scandal. Under the headline Haifa Chief Rabbi rebukes PETA for "misuse of his name," is an article made up of a compilation of various press releases. The article again misrepresents Rabbi Shear-Yashuv Cohen's position on PETA and on the Ba'al Teshuva Deception Issue. It also notes that Rubashkin meat is not currently sold in Israel because of the general ban on importation of meat from the United States due to the fear of Mad Cow disease. How Does KAJ Spend Its Money? How does KAJ spend the money it earns from its supervision of Rubashkin and Empire? The RCA is the largest Orthodox rabbinical organization in North America. It is currently embroiled in two scandals: Its handling of the Rabbi Mordechai Tendler allegations and now Shechita-gate, when it entered into the fray almost two weeks to back Rubashkin. The OU's Business Or Ours? How much business does the OU do each year? Where does the money really go? See here for an answer to the question several readers have raised. How about the OK? How much business does it do each year? Where does the money go? See here for an answer. Here's a better answer for the Star-K.
Is today's kosher supervision G-d's work or is it simply big business? The Jerusalem Report has an article on American kashrut agencies muscling in on European turf. According to Lubicom Marketing Consulting, a Brooklyn-based firm that researches the industry, the $8-billion kosher market in the United States has been growing at a 15-percent rate for the last few years. Ironically, most of that growth is not being driven by people who keep kosher. As Lubicom's research shows, the vast majority of kosher consumers buy kosher products because they believe they're safer, healthier or tastier. [T]he perception of the large American agencies' certification as a kind of global brand may be created by the agencies themselves. "Part of their tactics is to talk negatively about the local rabbinate to convince companies that staying with the local authorities will take them nowhere," says a rabbi who has worked with several of the agencies. Indeed, Rabbi Yosef Tirnauer, who serves the OU as a globetrotting kashrut supervisor, makes it clear … how he views the competition. "Whoever joins us, I tell them, 'Welcome to the club. We're the Mercedes.'" Turning to export manager Cakir, he promises, "If you pack this honey with the OU symbol, the sky is the limit. Catering, hospitals, airplanes. Even jails." So, is it G-d's work or big business? You decide. Rabbi Shear-Yashuv Cohen has written a letter on the Rubashkin scandal. Lubicom, the kosher industry's trade group, has released the letter and added its own spin to Rabbi Cohen's words. Rabbi Cohen's letter in effect means that, because he did not know where the slaughterhouse was or who its supervising rabbi was, he was misled by PETA. Implied in the letter is that, if Rabbi Cohen had known that the OU supervises the slaughterhouse in PETA's video, he never would have made the statements condemning the slaughter. Why? The OU's record is "impeccable." In other words, slaughter that Rabbi Cohen found appalling and not in accordance with Jewish law just became koher and faultless because Rabbi Cohen has accepted at face value the testimony of the very rabbis accused of misconduct. Lubicom added the following to Rabbi Cohen's statement: "Rabbi Cohen had earlier revealed that the PETA official who had contacted him had misrepresented himself as a baal teshuva (returnee to authentic Judaism)." But, as one can see here, Rabbi Cohen makes no such claim. I am an increasingly observant Jew. I don't imagine becoming fully Orthodox, but I'm a great believer in the power of the two institutions that kept Jewish communities whole throughout the centuries: kashrut and Shabbat. I became attracted to kashrut, in particular, for two reasons: its ethical foundations and the way it brings Judaism out of the synagogue, elevating a mundane aspect of daily life. The ethical impact of kashrut is found most broadly in the simple idea that people, unlike animals, should not eat anything they want to. Automatically, this raises consciousness toward animals, as shown by the general Jewish revulsion for hunting. But the most concrete sign of kashrut's ethical basis are the laws of shehita (kosher slaughter). To me, if kashrut is not on the cutting edge of humanity toward animals, it's not kashrut. I would be happy to pay extra for "ethically glatt" meat. I have already stopped eating veal, and consider that decision part of my kashrut observance. Until I can be assured that shehita is being performed according to the full letter and spirit of Jewish law, I think I will have to avoid "kosher" beef as well. Kosher slaughter restraining area floor is required to be graded in such a way as to facilitate drainage and prevent contact of the carcass with blood. It seems Rubashkin violated this as well. The Food Safety and Inspection Service (FSIS) is the Agency within USDA responsible for ensuring compliance with the Humane Methods of Slaughter Act. FSIS employs a Veterinarian and slaughter line inspectors at every federally inspected slaughter establishment. The Veterinarian enforces humane slaughter methods throughout the entire plant. The Veterinarian and slaughter line inspectors observe the methods by which cattle, sheep, swine, goats, horses, mules, or other equines are slaughtered, ensure plants take corrective action where needed, and are responsible for reporting instances of inhumane treatment of animals as they carry out their primary food safety-related inspection responsibilities. FSIS Veterinarians and inspectors stop the production line if they see any violations of the humane slaughter regulations. Indeed, this is how USDA Directive 6900.2 was originally worded. But sources tell me that, after a meeting in Washington on the afternoon of October 23, 2003 between US Secretary Of Agriculture Ann Veneman and a group of rabbinic leaders from the OU, Star-K and CRC, along with Rubashkin's attorney Nathan Lewin and Menachem Lubinsky of Lubicom (Kosher Today, Kosher Fest, etc. ), the directive's language was changed. Inspectors hands were now tied and they could not stop the line or do anything except file a report with their district office, which then had to get permission from Washington in order to act. It appears that the throat-ripping procedure began shortly after. It is forbidden to use any form of electric prod to herd the animals into the slaughtering stand. Similarly, no electric current can be applied to accelerate the drainage of blood from the carcass after the slaughter. "Technically, the shehita is kosher, but some of the things they do deviate from the rabbinate's guidelines," said Rabbi Ezra Raful, head of the rabbinate's international shehita supervision department, who watched the PETA video together with the Post. "You see there, it looks like he ripped out the trachea and esophagus. We do not allow the animal to be touched after the shehita until the main part of the bleeding stops. "That means no stunning like they do in Australia, and no attempts to speed the bleeding like what they are trying to do here." "Look," noted Raful, "he did not cut one of the jugular veins, so blood is still flowing. That's another reason for not accepting that shehita. It looks as though the animal wasn't slaughtered properly." Of course, the PETA video demonstrates the use of electric prods and throat-ripping, both forbidden by the Chief Rabbinate. Further, it appears that Rubashkin's slaughter practices differed depending on whether the Chief Rabbinate had its own inspectors on-site or not. Further, the slaughter of the animal that resulted in improperly severed jugular veins was a violation of the United States Humane Slaughter Act, as was the slaughter of many of the animals on the PETA video. The United States Humane Slaughter Act requires that the jugular veins and the carotid arteries be severed instantaneously in one rapid, smooth cut. If the cut does not sever the jugular veins and the carotid arteries and the animal shows signs of consciousness (like those seen on the PETA video), the animal must be immediately stunned. [Postville's] Mayor John Hyman presented the award to the Rubashkins who received a standing ovation from a large contingent of city representatives, employees of Agriprocessors, and business associates. Nine members of the ultra-orthodox Lubavitcher Hasidic sect were arrested on a Crown Heights street yesterday after a violent dispute erupted over a plaque honoring the sect's holiest figure. Seven men and two women were arrested as cops flooded the area outside the sect's synagogue and headquarters at 770 Eastern Parkway at 11:30 a.m. in response to a report of a disturbance involving nearly 300 Lubavitchers. The charges included resisting arrest and disorderly conduct. The violence erupted over the words "of blessed memory," which were inscribed on a plaque under the name of Lubavitcher Grand Rebbe Menachem Schneerson that had been affixed to a cornerstone at the synagogue's entrance. The inscription goes to the heart of a long-standing dispute that has split the insular community. One faction believes Schneerson is dead. The other believes the grand rebbe is alive - and coming back as the Moshiach, or Messiah. Nine people were arrested yesterday in a melee at the headquarters of Brooklyn's most visible ultra-Orthodox Jewish movement, which is divided over whether the Lubavitcher founder, Rabbi Menachem Schneerson, is alive or dead. Workers at Lubavitch World Headquarters at 770 Eastern Parkway in Crown Heights were installing a new plaque on the building which refers to Schneerson's "blessed memory." But followers of Lubavitch's "messianic" wing object to those words, because they believe Schneerson — who died in 1994 at age 92 — lives in spirit and flesh. Some who are convinced that Schneerson lives fought the workers installing the plaque and other Lubavitchers who oppose their views, police and witnesses said. Lubavitcher messianists say that instead of referring to Schneerson's "blessed memory," any new plaque must say: "Long live our master, our teacher, our Rebbe king messiah, forever and ever." Just remember folks. They slaughter your meat. Notice [Chabad-Lubavitch spokesperson] Zalman Shmotkin never said outright that their leader was NOT the messiah. What he took issue with was their actions. He believes dead Jews can be the Messiah. And this is the core of the issue: Tactics, not beliefs. You will not find Zalman Shmotkin EVER saying that a dead Jew can't be the Messiah. I'm sure he reads this blog. Challenge him to say otherwise. You can read the Daily News article here, the Post article here, or both after the jump. Making A Mountain Out Of A Pizza? The JTA reports on El Al's continuing kashrut problems and the OU's reaction to them. In brief, the OU's complaint focuses on two incidents. Both took place when El Al flights were stalled at gates for long periods of time. In each each incident, flight attendents left the plane and purchased non-kosher food and then distributed it to passengers. When asked if the food – pizza in one case, cheese sandwiches in another – was kosher, El Al personnel claimed that it was. These incidents have caused the OU to remove supervision it never really had on unsealed El Al meals originating from New York. For years the OU has cetified the caterer of the meals, but has not made clear until now that its supervision ends at the caterer's door, unless the meals are double-sealed and double-wrapped. What is truly sad about this is that it appears El Al personnel, while trying to help passengers stuck in a very uncomfortable situation, made an honest mistake. Both food items served appear to have been dairy-based and without any meat ingredients. Most non-Orthodox Jews are unaware of the intracacies of kosher observance. It is reasonable to assume that the employees truly believed the food to be kosher, and that their mistakes will not be repeated. Compare that to the current Shechita-gate Scandal. Neither Rubashkin, his attorney Nathan Lewin, or any of the kosher supervising agencies involved (except for part of the OU) has either admitted wrong or pledged to repair the situation. So, I ask you – what is the greater kashrut problem? Eating a cheese sandwich when the bread and cheese lack supervision or eating the meat of a steer whose neck was ripped out with a hook 5 seconds after shechita? Readers have noted an "attack" (to borrow a word from Nathan Lewin) on PETA organized by the Center For Consumer Freedom. Perhaps most disturbing is this brief audio excerpt of PETA's Bruce Friedrich condoning vandalism against medical research labs, slaughterhouses and fast food restaurants. 1. Does this still represent your opinion? 2. Were you an employee of PETA when you made those remarks? 3. Do those remarks reflect PETA's position? 4. Has PETA ever come out against violence and vandalism against slaughterhouses? 5. Has PETA ever come out against violence and vandalism against medical research labs? 6. Has PETA ever come out against violence and vandalism against fast food restaurants? 7. When and where were these remarks made? "No. That was more than three years ago and I was a bit shaken up by a truly shocking video documenting a tragic situation for egg laying hens (probably the most intensively farmed and horribly abused of all farmed animals):"
"It's not really our place to come out for or against such things; we operate in exclusively legal means, focusing on public education, and we encourage others to do the same. We focus 100% of our efforts on promoting compassion for animals, and we do not criticize other animal rights groups. We offer about a million and one things for people to do, all completely legal." "An animal rights conference in D.C., July 2001." Mr. Friedrich pointed out that these remarks were made almost 3 1/2 years ago. He also directed me to this website dedicated to combatting the Center For Consumer Freedom. Not surprisingly, the Center's director, Rick Berman is a well-known food, beverage and tobbacco industry lobbyist. I must add that, I found Mr. Friedrich's answers to the questions satisfactory except for his contention that, "It's not really [PETA's] place to come out for or against" vandalism by animal rights activists and that PETA "do[es] not criticize other animal rights groups." I would think that, now more than ever PETA needs to take a firm stand against this type of violence. It would be a shame if the much-needed reforms and obtainable goals PETA seeks to achieve would be lost because of a reluctance to condemn violence that is both illegal and unproductive. AgriProcessors attorney Nathan Lewin has written an article for this week's Jewish Press. In it he criticizes the leadership of the OU for its lack of support for Rubashkin. It is a "scientific fact" that animals after shechita are insensate after 2 to 6 seconds. Ripping out the trachea (not cutting the carotid arteries) was done because it facilitates bleeding. "[F]rom the video, there was no reason to think that the animal felt any more pain from this removal than an appendicitis victim under anesthesia feels when his appendix is removed." PETA has demanded that Rubashkin hire a named veterinary-medicine professor as a supervisor over kosher slaughter. He again claims that PETA's Ronnen misrepresented himself to Rabbi Shear-Yashuv Cohen as a Ba'al Teshuva (returnee to Orthodox Judaism), a charge that Rabbi Cohen denies. Numbers 2, 4 and 5 are absolutely false. Number 1 is true only for absolutely perfect standing shechita in the ASPCA-approved pen, not for the type of shechita practiced at AgriProcessors. Number 3 is ridiculous and has no non-rabbinic expert to back it up. Mr. Lewin also fails to mention over one year's worth of correspondence from PETA to AgriProcessors before PETA went public trying to have the situation addressed. AgriProcessors has also been the victim – albeit less intentionally – of Orthodox rabbis who are unwilling or unable to abide by Avtalyon̓s wise caution: “Chachamim, hizaharu bedivreichem” (Scholars, be cautious with your words!). Several well-placed rabbis involved in this affair have told me that Agudath Israel of America is "cracking the whip" to keep its member (and non-member) rabbis in line with its take on this issue. It seems to be no coincidence that Mr. Lewin writes of Agudath Israel in glowing terms and that the headline of his article is "The Assault On Shechita," exactly mirroring Agudath Israel's position. Watch the PETA video again. Read the interviews linked on the left sidebar of this page. Then you decide – should Mr. Lewin's article be more properly titled, "My Assault On Truth and Common Sense"? I find it hard-pressed to see how one could think otherwise. PETA's December 10, 2004 letter to KAJ can be downloaded here. .